There’s something so special about a beautiful dessert. Think of a sharable chocolate soufflé, a mile-high New York cheesecake, or the Italian Creme Cake your grandma made for your birthday (definitely something that happened for me). It’s the carefully laced lattice on a pie at Thanksgiving and the croquembouche served at your wedding. Desserts- to me, at least- are the champagne toast of a meal. They’re the sweet ending, the reason why we gather, the one last hurrah and rally before your friends leave for the night. When it comes to making something that will garner ooh’s and aah’s, that’ll make people point and ask, “What’s that? ?” I always pull out the stops and go big. Dark, bitter chocolate, lavender-laced whipped cream, or a tower of French crepes. Add all ingredients for crepes in a blender, and blend until no longer lumpy- you will need to scrape down the sides of the blender. Once the bubbles have settled, begin cooking crepes in a 9-inch crepe pan (the one I use) over medium-low heat. For each crepe, pour 1/3 cup of the batter into the pan, and swirl the pan quickly, off heat to allow the batter to coat the bottom. Once the crepe begins to look dry and the edges easily pull away from the pan, flip, using a large, thin rubber spatula (love this one) and cook for 30 seconds or so on the opposite side. Stack crepes in a spiral on a plate until ready to assemble. Know this: the first crepe will always- ALWAYS– stick, and you’ll be discouraged, but don’t worry. Crepe number two forward will be just fine. For the filling, mix the cream cheese, curd, and extract- if using- in a large bowl. Rinse beaters, then beat heavy cream in a separate bowl until stiff peaks form. Add whipped cream to the cheese/curd mixture and beat on low until well combined. Begin to assemble. 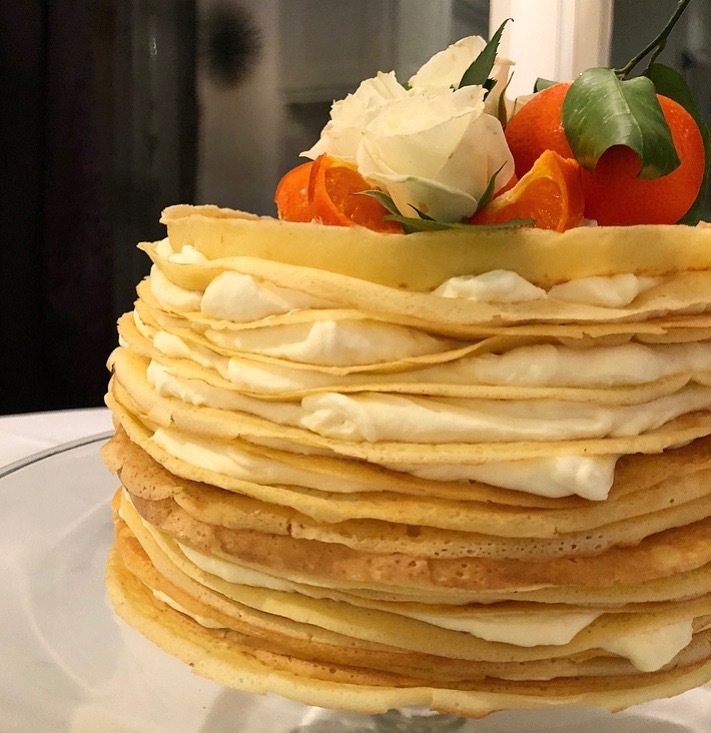 Stack crepes, with a hefty spoonful of filling between each layer, going as high as you’re comfortable. I like 25-30 crepes in each cake. 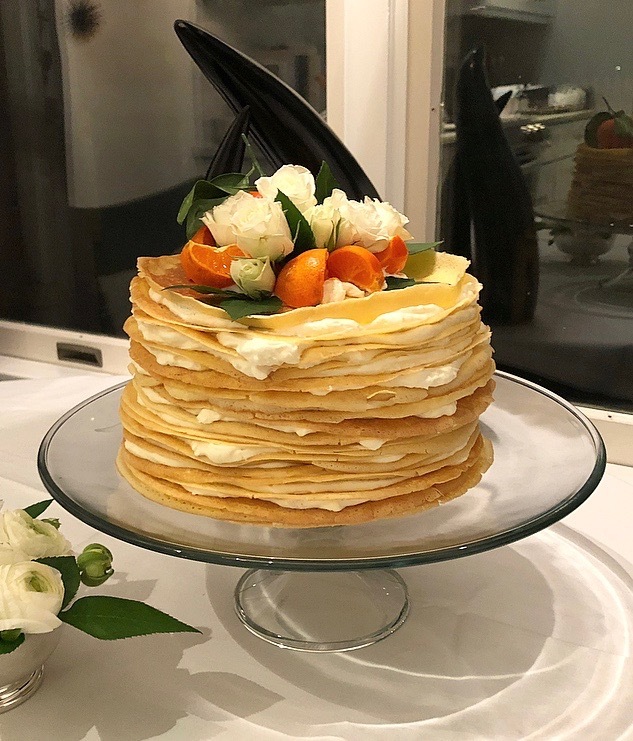 Once all crepes and filling have been stacked, drive 3 skewers or chopsticks into the cake to hold it’s shape, and chill in the fridge overnight. To serve, top with flowers, orange slices, candied citrus, or raspberries. Need help knowing how to cook a crepe? Follow this link.